My whole life, Math has made me anxious. It was not only my hardest subject, but at times, it felt like my worst enemy. In elementary school and middle school, I managed to obtain decent final grades in Math class because of my extremely consistent work habits and nightly homework help from my mom. However, as I got older, at times there was only so much my mom could do to help. I was diagnosed with NVLD in ninth grade after struggling with and failing both Geometry and Physics. My visual spatial deficits and slow processing speed made those two subjects incredibly challenging for me. I remember leaving half of the questions blank on my first Geometry test. I struggled so much that I was placed back into Algebra for the remainder of the year. Initially, I felt proud that my basic Algebra skills were solid enough to place me in Geometry. My confidence took a massive hit as a result of not doing well. I retook Geometry in 10th grade and barely passed. In 11th grade, I took Algebra II, which was much harder for me than Algebra I. I barely passed Algebra II. I was advised not to take Math in 12th grade (only three years of Math were required to graduate). Even with tutoring, I still struggled, partly because I hadn’t developed skills to help me do well in my own way. It hurt that I constantly felt like I wasn’t smart. Fast forward to college. When I attended Landmark, a college exclusively for students who have learning disabilities, I took College Algebra my first semester and Statistics my third semester. I did well because I got all the help I needed—I spent a lot of time in the Math support center and my professors were specialized in teaching math to students with learning disabilities. 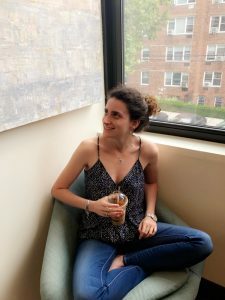 Robin “The Math Lady” Schwartz, who I know from my neighborhood and spent 10 days in Israel with, posts all sorts of Math problems on her Instagram page. Robin is a (really awesome!) former engineer and portfolio manager turned tutor, teacher, speaker, and the founder of “Build Math Confidence.” This past summer, I started doing some of her Math problems out of curiosity and boredom. I was impressed at myself when I got one of her Percentage problems right. I started doing her Algebra and Fractions problems, too. Even if I got them wrong, I didn’t feel discouraged and I was determined to find the right answer. The Math Lady and I were talking and I teared up when she told me I was good at Math. It meant so much to me because I’ve never really felt that way. Math still isn’t my favorite subject, and Statistics, Geometry, or Calculus aren’t classes I would voluntarily take. However, I now have strategies and tools to do better in Math. I’ve grown increasingly confident in my overall abilities since I graduated from Landmark in 2014. My accommodations entitle me to a “cheat sheet” of equations on exams. Writing things out step-by-step is a strategy that has helped me tremendously. If I know and practice steps for different problems, I can do it the same way every time. There are some components of Math, that, with practice, I am good at. For example, I’m good at Mental Math after years of staring at numbers on highway signs. I have a very strong working memory, so memorizing the multiplication tables in elementary school wasn’t very hard for me. It’s important to consider that the NVLD diagnosis is manifested differently in everyone who has it. There are individuals with NVLD who might struggle in Math more than I have, and individuals with NVLD who might be very strong in Math. In hindsight, my relationship with Math has always been complicated, rather than Math simply being my worst enemy. I’m not going to be a Mathematician or a Math teacher—not because I can’t, but because my desired career path is a social worker and to work with students who have learning disabilities. I cannot overemphasize the importance of learning strategies for Math or any subject. In fact, I hope to share some of my own learned academic skills with my future students. My goal is to be an advocate for individuals with learning disabilities so that they can get the help they need. My advice, especially to those, particularly with learning disabilities, who struggle in Math: You aren’t alone. I always say “go forth and conquer!”—(for me I see it as Math, then the world). Finally, as corny as it sounds and as hard as it can be (I still struggle with this), be kind to yourself. As daunting as Math is and can be… you got this. It will be okay. And, you’ve got the world at your feet to conquer next. I’m a lover of nature, poetry, and iced coffee (in my humble opinion, the only coffee truly worth drinking). I’m naturally extroverted, and I think of myself as a people person! I’m studying to become a social worker because I want to be able to help individuals with learning disabilities just like me! I am a Project Social Ambassador for The NVLD Project.